The American set Augusta National alight on Saturday, with a sizzling eight under 64 catapulting him up the leaderboard to within two shots of the lead and tied with Woods. In the post-round press conference, the Utah native revealed how he was eight years old when he watched Woods cruise to a sensational win at the 1997 Masters. Now, 22 years later, Finau well step on the first tee with his idol on Masters Sunday. “The first golf tournament I ever watched was the ‘97 Masters,” said the world number 15. “Just watching Tiger dominate the way that he did was very inspiring for me for some reason as a kid. Tiger is a huge, huge inspiration and influence on me and that 97 Masters meant a lot. Making his debut at Augusta last year, Finau dislocated his ankle in a bizzare slip during the par three contest. Despite that, he hobbled to T10 finish and he is taking lessons from the effort. “Last year was awkward for me, just getting through those first couple of rounds, just because of the way I felt,” he continued. “Mentally I think it helped because it took a lot of the pressure off but you never want to be in physical pain when you’re playing at a high level. “As well as I played last year, I didn’t have a chance to really win. Last year I had the lead going into the final round of the U.S. Open and I took a run at it towards the end. 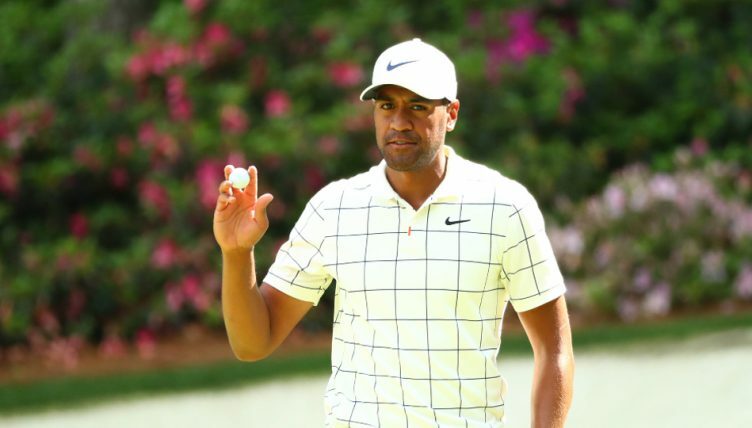 Finau will play with Woods and leader Francesco Molinari in the final round.